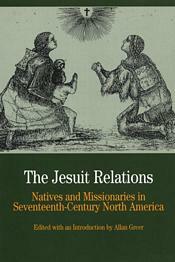 As a 73-volume library, the original The Jesuit Relations has long been inaccessible to undergraduate students. Vitally important, the writings of seventeenth-century French Jesuits in Native North America tell the story of early American encounters. This new edition deftly binds them into a thematically arranged, 35-document sampler with a detailed introduction that provides background on these missionaries, the Indians, and their cohabitation in early North America. Colorful journal entries by such fathers as Paul LeJeune, Jean de Brébeuf, Isaac Jogues, and Jacques Marquette describe the Huron, Algonquin, Iroquois, and Montagnais peoples. Eleven images, two maps, a chronology, a bibliography, and questions for consideration supplement these firsthand accounts. "The Jesuit Relations are among the most important scholarly sources for the study of early American history, and they're simply magic in the classroom. Greer's thoughtful translations and his concise, well-informed introduction do justice to these remarkable documents. The gripping, vivid selections from the Relations will fully engage undergraduates, dissolve their stereotypes of both Indians and colonists, and allow them to gain a more nuanced view of life in early America."